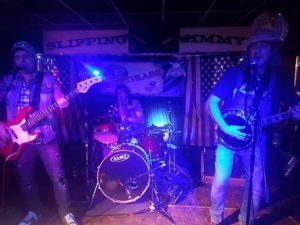 Rokgrass are a hillbilly/rockabilly style band consisting of hillbilly brothers, Will. Lee and Stefan, who try to bring new life to many classic songs the audience may well know but certainly not in their style. For example think Motorhead, The Wurzels & Deliverance meets George Formby and you’d be half way there……..Yyyyyyyyeeeeeeehhhhaaaaa a a!!! !